Today is the most important day of the year where we get to shed evils within us and seek forgiveness from all beings. 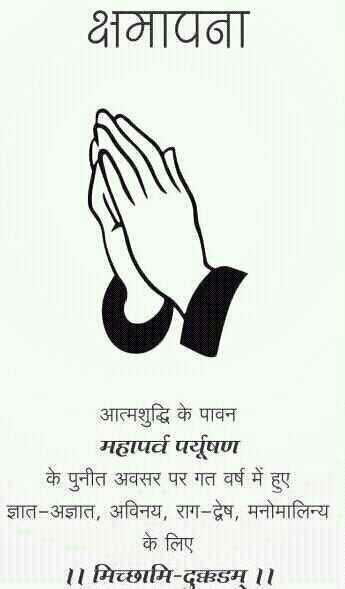 Jain religion gives us many opportunities to clean our souls, live a happy and peaceful life. JAINA has always worked for the cause of Community. On behalf of JAINA EC and BOD, if we have knowingly or unknowingly hurt you over past year, we seek your forgiveness. Tomorrow is the first day of Das Lakshana Parva and we wish all of you to celebrate the same in high spirits and live Jain Way of Life. The matter which creates life is called Ayusya Karma. As the name suggests, this Karma determines the lifespan of any particular being. It is not normally possible for any being to live longer or shorter than the period fixed by this Karma. This is irrespective of divine, human, animal or infernal life. There are however exceptional cases where a person endowed with special achievements can reduce the lifespan by bearing the destined consequences in a shorter period. This is known as Udirana. Taking those professions wherein living beings are killed every moment 1) by hoarding; 2) by meat-eating; 3) a soul goes to the hell by killing a living being having; 4) senses. A living being goes to the tiryanca birth i.e. gets the birth of an animal or a bird by 1) telling lies deceitfully, 2) by treachery, 3) by telling lies, 4) by using wrong scales. A living being, who is 1) naturally free from fraud, 2) who is courteous by nature, 3) merciful and free from jealousy, gets the birth of a human being. A living being gets the birth of a god i.e. he becomes a god, a goddess, an Indra or an Indrani by 1) observing self-control after initiation, 2) by observing the 12 vows as a householder, 3) by performing penances and 4) by enduring pain with equanimity. 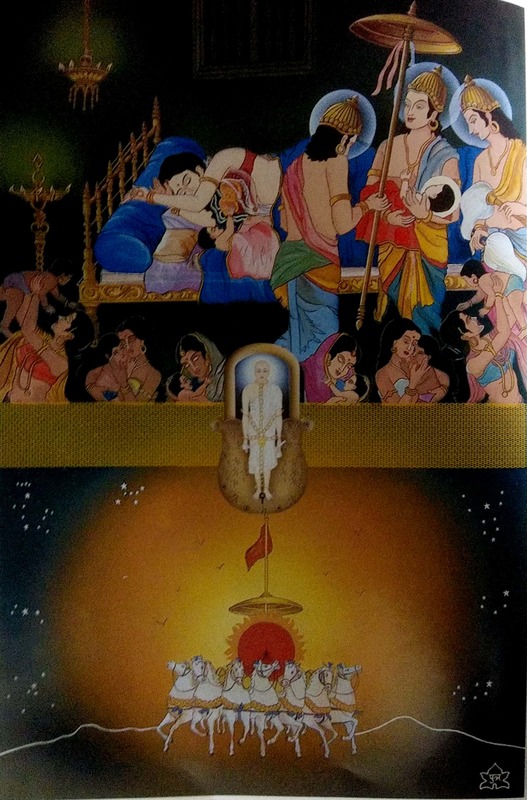 Oh great Rishabhadeva! Oh God Adideva! Birth of babies is common course of affairs on the earth; but oh my Lord, Mother Marudevi was the greatest mother of whom a great child, yourself was born, who first preached the religious values, code of conduct, law of ethics, various science, arts & aesthetics and path of salvation of life. Undoubtedly true, the Godly children cannot be born to mothers. Look at those Northern, southern and western directions. Just on the onset of night, lots of stars are seen and the whole sky is filled with them. But who produces the lamp to brighten the whole Universe? The East only. Oh Lord! your mother Marudeva was also a mother like eastern direction. A great and a unique Mother. Salutations unto such a Grate Mother of yours! O The Master on Monks! 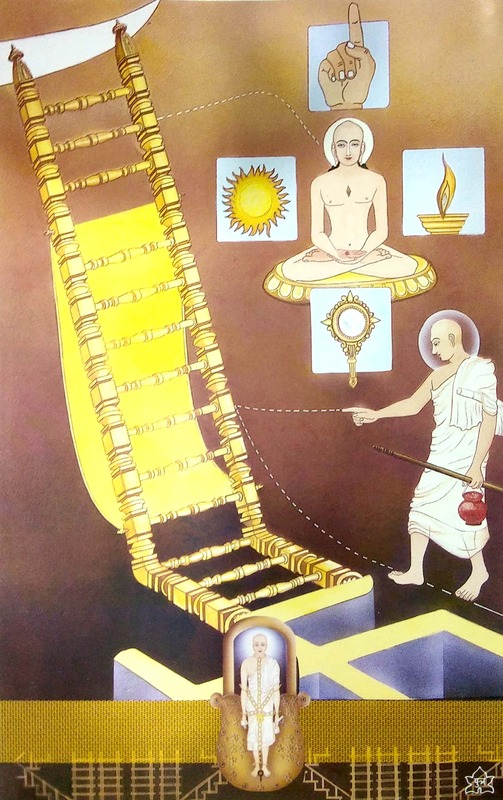 Upon lot of thoughts and hypotheses, the scholar-saints have finally concluded that you are the only preacher and giver of KEVAL JNANA the ultimate enlightenment, and hence you are a PARAM PURUSHA- the supreme super human! The thinkers, who attained their status after a greatpenance, rightly address you as AMAL because there is no trace of any impurity in you. Your omniscience and total detachment are seen in highest esteem by scholars and they rightly address you, your delusionless self as” TAMSAH PARSTAT” – beyond darkness.! Hence oh Lord! I am fully convinced that death – the cycle of birth & death – can be overcome and Moksha can be attained by following your preaching. One may try any other path for enlightenment, but oh Lord, the path preached by you is the shortest, safest and ultimately accepted by all. Noble and serene saints and scholars pray to you with their following words and attributes. Your eternal power is not going to corrode for time immemorial and hence they call you “AVYAYA”. Most of us perform the soul purifying Samvatasari Pratikraman either because of deep faith in religion or tradition or other reasons. Performing any ritual without understanding its meaning has a very limited benefit. Awareness is the key to spiritual success. This is an attempt to improve one’s understanding of the Pratikraman Ritual at the macro level, thought pattern and increase awareness of its broad meaning. Click on the below link to learn about the Essence of Pratikraman. We are thankful for your past support which has helped to grow JAINA where it is today. 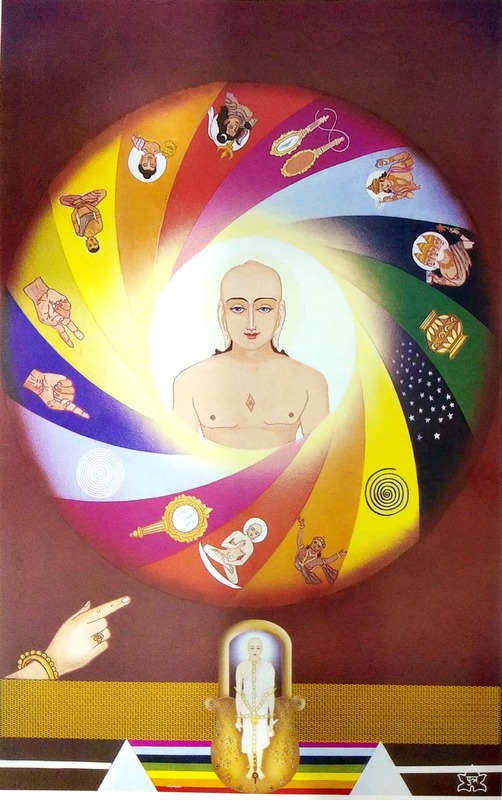 Your donation will help JAINA to spread Jain Religion and share the Jain way of life in various ways as always. The impact of even a small donation makes a big difference. Please make your kind donation at the below link. You have received this email because you are currently subscribed to receive general correspondence. @@unsubscribe_url@@ if you no longer wish to receive these communications.